MuchMusic launched the year I was born, so I’d be lying if I said I knew a whole hell of a lot about the station’s formative years. That being said, with the majority of my teenage years spent glued to the TV, I have fond memories of the channel as a hub for pop culture. In the days before the internet’s file-sharing software (Napster/Kazaa/Limewire) and later YouTube, MuchMusic was the only place to see and hear your favorite bands without dropping twenty dollars on a piece of physical media. If anything, this book is comprehensive. Ward goes through the early days of CITY TV’s late night music video show “City Limits” and how that evolved into what would become MuchMusic – a co-creation from broadcasters John Martin and Moses Znaimer. Ward details the loose atmosphere implored by the duo; how they wanted the station to feel like a “flow” of programming rather than a tight schedule of individual shows. 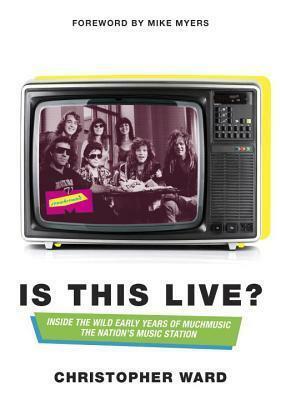 Ward also delves into the music videos that would define the early years of the station. Interviews with Canadian musicians Bryan Adams, Alan Frew (Glass Tiger), Jim Cuddy (Blue Rodeo), Jimmy Rankin and others are peppered throughout the book as they explain the relatively new process of creating videos as promotional tools. This is where I found the book lost a little bit of its focus as I felt too much time was devoted to the videos themselves and their production rather than the operations of the station. This is purely preference on my part, but I wish Ward had further explored the 90s, but alas, that was not within the scope of the book. The closest we get are a few short interviews with Rick Campanelli, Ed The Sock (Steve Kerzner), Master T and Bill Welychka. It’s really sad to see what MuchMusic has become now. Long gone are the days of VJs, countdowns and “videoflow” programming but honestly, who could blame them? Your favorite band’s latest videos are now available at your fingertips so who wants to wait around for hours for their favorite song to be played? After its sale to Bell Media in 2006, the station gradually shifted focus to become more of a destination for comedy programming, reality shows and teen-dramas – they even dropped the “music” part of “MuchMusic”! Christopher Ward has produced a much (pardon the pun) appreciated account of the little station that could; a rebel channel existing on a shoestring budget that penetrated the cultural zeitgeist of young Canadians in the 80s to become destination programming. I would have preferred a more focused approach and a wider scope, but it is what it is. Folks around during the station’s launch may get a bit more out of it than I did.